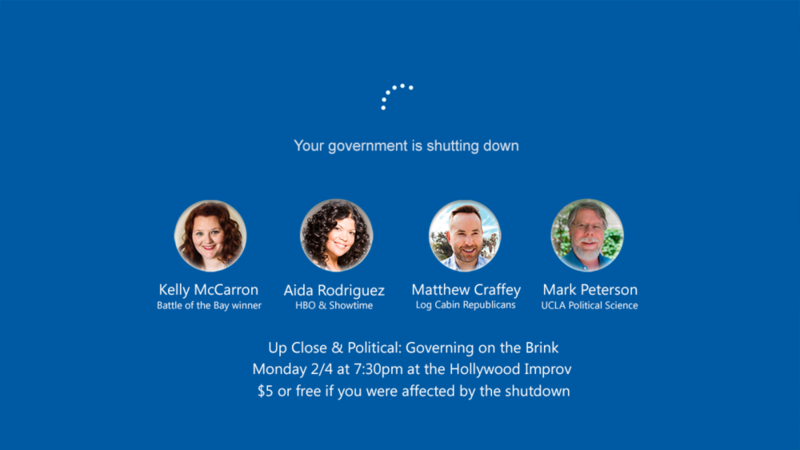 Up Close & Political: The Shutdown Showdown is February 4th! We're back and talking about the current showdown over the government shutdown! (Yes, last week's is over, but next week's hasn't even started yet). We're discussing national emergencies, the current stalemate, and whether these will be a fixture of our politics forever or if we will, at some point, have a shutdown to end all shutdowns. Kelly McCarron, winner of the Battle of the Bay comedy competition and producer of Operation Funny! Aida Rodriguez, seen on HBO and Showtime! Matthew Craffey, chair of the Log Cabin Republicans of California and writer for The Advocate! Mark Peterson, UCLA professor of Political Science specializing in American government who's appeared on CNN and NPR! Hosted by Toby Muresianu of Comedy Central's Roast Battle. Tickets are just $5, and free if you weren't paid during the shutdown!